David Chao stands with Vancouver mayor and head of press at Daimler corporation.... at the launch of car2go.com. Car2go offers on-demand rental cars of SMART cars and it's free registration for the next 30 days! 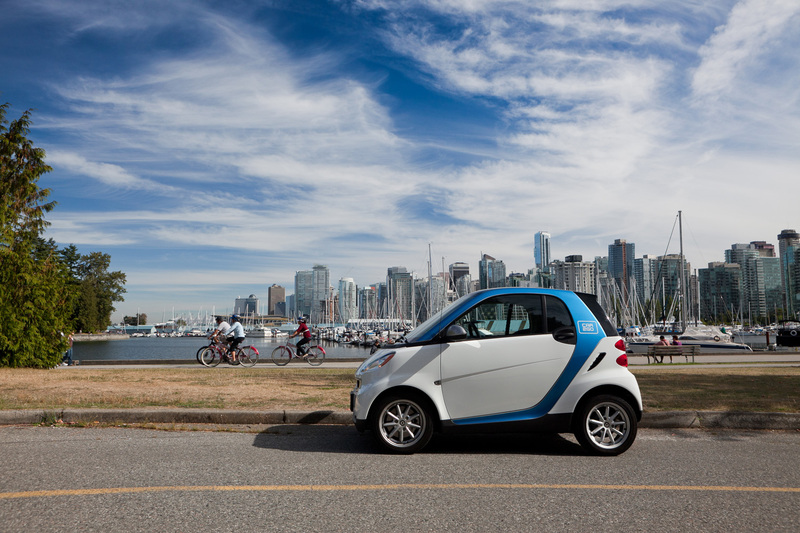 April 27, 2011 - VANCOUVER, B.C.– car2go announced today that Vancouver, British Columbia, is the first Canadian city selected to launch its innovative mobility service. A newly created company, car2go Canada Ltd., a subsidiary of Daimler North America Corporation, will also be located in Vancouver. Nicholas Cole, President and CEO of car2go Canada Ltd., and Vancouver Mayor Gregor Robertson made the official announcement this morning to the press as well as to business, political and civic leaders who also took this opportunity to test drive the smart “car2go edition” vehicles and learn about car2go’s unique approach to car sharing. First launched with great acclaim in Ulm, Germany, three years ago, car2go was successfully rolled out a year later in North America in Austin, Texas. To date, a total of more than 35,000 customers have joined the car2go program in Ulm and Austin. There have been more than 600,000 fully automated rental transactions, averaging between 10 and 60 minutes. car2go was also recently introduced in Hamburg, Germany, and becomes operational in Amsterdam in the Netherlands at the end of 2011. As a city whose mandate is to become the world’s greenest city by 2020, Vancouver was a natural choice for the expansion of car2go in North America. car2go uses a “free-floating” model of car sharing, where cars are available throughout the city and can be accessed “on-demand” or reserved up to 24 hours in advance. car2go members can use car2go smartphone apps, the car2go website or a telephone hotline to find the nearest vehicle within the 47-square-kilometre pickup and drop-off area which consists of the following quadrant: the south border follows 41st Avenue to the north border which follows the Burrard Inlet. The east border is Nanaimo Street and the west border is Alma Street. Members can drive the car when and where they want, and then they can simply leave it in any available “permit only” on-street parking spot in downtown or residential neighbourhoods within the defined business area, or in one of the specially marked car2go parking spaces. In essence, every trip is a one-way rental, with no need to return to the location where the driver picked up the vehicle. car2go charges customers only for the actual use of the vehicle, with rental periods as short as a per-minute basis. The rental prices in Vancouver are $0.35 CAD per minute, $12.99 CAD per hour and $65.99 CAD per day which includes fuel, parking, mileage, insurance, maintenance, cleaning, GPS navigation and a 24/7 hotline customer support. The smart “car2go edition” vehicles, developed in collaboration by car2go and smart in Germany, are the world’s first series-produced automobiles designed and manufactured specifically for car sharing. Every car2go vehicle is outfitted with a solar roof and innovative telematics hardware, including an onboard computer with an easy-to-use touch screen with radio and GPS controls. The smart “car2go edition” vehicles for Vancouver are provided by Mercedes-Benz Canada and its Vancouver Retail Group. A network of 225 fuel-efficient, low-emission smart “car2go edition” vehicles will be available to Vancouver car2go members as of June 2011. Starting today until May 29, 2011, Vancouver residents can pre-register for their car2go membership without having to pay the registration fee (a $35 CAD value) at www.car2govancouver.comusing Promo Code: VAN, or in person at the car2go office at 45 Water Street in the Gastown area of downtown Vancouver. car2go conducted a trial assessment of its service in Vancouver from June 2010 to March 2011 with select test users from well-known and respected local organizations like Wavefront, the Vancouver Public Library, the Vancouver Film School and Bard on the Beach. The assessment was used to validate and refine business processes and technical systems prior to the large-scale rollout. The strong support for the car2go model throughout the pilot helped cement Vancouver as the first Canadian city for this unique service.